Human T cell leukemia virus type 1 (HTLV-1) Tax is a potent activator of viral and cellular gene expression that interacts with a number of cellular proteins. Many reports show that Tax is capable of regulating cell cycle progression and apoptosis both positively and negatively. However, it still remains to understand why the Tax oncoprotein induces cell cycle arrest and apoptosis, or whether Tax-induced apoptosis is dependent upon its ability to induce G1 arrest. The present study used time-lapse imaging to explore the spatiotemporal patterns of cell cycle dynamics in Tax-expressing HeLa cells containing the fluorescent ubiquitination-based cell cycle indicator, Fucci2. A large-scale host cell gene profiling approach was also used to identify the genes involved in Tax-mediated cell signaling events related to cellular proliferation and apoptosis. Tax-expressing apoptotic cells showed a rounded morphology and detached from the culture dish after cell cycle arrest at the G1 phase. Thus, it appears that Tax induces apoptosis through pathways identical to those involved in G1 arrest. To elucidate the mechanism(s) by which Tax induces cell cycle arrest and apoptosis, regulation of host cellular genes by Tax was analyzed using a microarray containing approximately 18,400 human mRNA transcripts. Seventeen genes related to cell cycle regulation were identified as being up or downregulated > 2.0-fold in Tax-expressing cells. 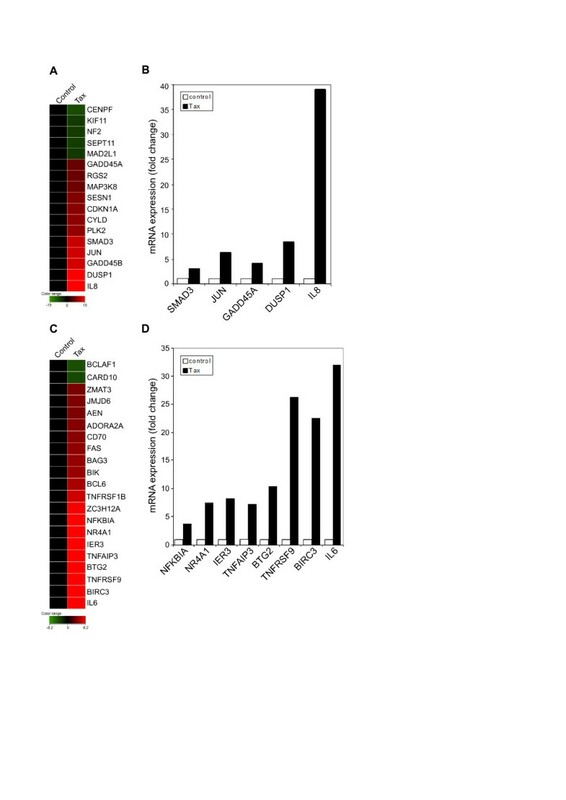 Several genes, including SMAD3, JUN, GADD45B, DUSP1 and IL8, were involved in cellular proliferation, responses to cellular stress and DNA damage, or inflammation and immune responses. Additionally, 23 pro- and anti-apoptotic genes were deregulated by Tax, including TNFAIP3, TNFRS9, BIRC3 and IL6. Furthermore, the kinetics of IL8, SMAD3, CDKN1A, GADD45A, GADD45B and IL6 expression were altered following the induction of Tax, and correlated closely with the morphological changes observed by time-lapse imaging. Taken together, the results of this study permit a greater understanding of the biological events affected by HTLV-1 Tax, particularly the regulation of cellular proliferation and apoptosis. Importantly, this study is the first to demonstrate the dynamics of morphological changes during Tax-induced apoptosis after cell cycle arrest at the G1 phase. Human T cell leukemia virus type 1 (HTLV-1) causes adult T cell leukemia (ATL), a severe and fatal lymphoproliferative disease of helper T cells , and a separate neurodegenerative disease called tropical spastic paraparesis/HTLV-1-associated myelopathy (TSP/HAM) . HTLV-1 encodes a 40 kDa regulatory protein, Tax, which is necessary and sufficient for cellular transformation and is, therefore, considered to be the viral oncoprotein. Tax is a potent activator of both viral and cellular gene expression, and the oncogenic potential of Tax is thought to depend on its ability to alter the expression of cellular genes involved in cell growth and proliferation, and its direct interactions with cell cycle regulators [3, 4]. Tax-mediated transcriptional activation of cellular gene expression requires direct contact with components of the cyclic AMP-response element binding protein (CREB), nuclear factor-κB (NF-κB), and the serum response factor (SRF) signaling pathways . Moreover, Tax is thought to be involved in other cellular processes including DNA repair, cell cycle progression, and apoptosis [6, 7]. Tax stimulates cell growth via cell cycle dysregulation [3, 4, 7]. A major mitogenic activity of Tax is stimulation of the G1-to-S-phase transition [8–12], and several different mechanisms have been proposed to explain the dysregulation of the G1 phase and the accelerated progression into S phase. In mammalian cells, G1 progression is controlled by the sequential activation of the cyclin-dependent kinases (Cdks) Cdk4, Cdk6, and Cdk2. Activation of these Cdks by Tax leads to hyperphosphorylation of Retinoblastoma (Rb) and the liberation of E2F, which is essential for cell cycle progression [12, 13]. Tax interacts with cyclins D1, D2, and D3, but not with Cdk1 or Cdk2 [11, 14–16]. By binding to cyclins, Tax stabilizes the cyclin D/Cdk complex, thereby enhancing its kinase activity and leading to the hyperphosphorylation of Rb. Moreover, Tax activates the transcription of cyclin D1 and D2 [17, 18] by deregulating the NF-κB pathway [18, 19]. By contrast, there is evidence that Tax induces cell cycle arrest at the G1 phase . HTLV-1 infection and Tax expression in human cells have been observed to induce cell cycle arrest at the G1 phase by inducing p27/kip1 and p21/waf1 , and the sharp rise in p27 induced by Tax is often associated with premature activation of the anaphase-promoting complex (APC) . Indeed, cells infected with HTLV-1 expressing wild-type Tax arrest at the G1/S boundary when subjected to cellular stress [22, 23]. Interestingly, Tax induces apoptosis in a variety of systems [24–26], consistent with its ability to inhibit DNA repair. Indeed, HTLV-1-infected cells undergo increased apoptosis upon cellular stress [22–28]; however, other reports show that Tax inhibits apoptosis [29–31], supporting its role as a transforming protein and an inducer of T cell proliferation. Therefore, it seems likely that Tax is capable of stimulating both pro- and anti-apoptotic pathways. Tax regulates cell cycle progression and apoptosis both positively and negatively; however, the molecular mechanism(s) underlying the regulation of these processes by Tax remain obscure. In this study, we examined the regulation of cell cycle progression and apoptosis by Tax and demonstrated the following: (i) a high level of transient Tax expression arrests the cell cycle at the G1 phase and induces apoptosis in HeLa cells; (ii) based on a microarray containing approximately 18,400 human mRNA transcripts, genes related to cell cycle progression and apoptosis were deregulated by Tax in HeLa cells; (iii) time-lapse imaging of a fluorescent ubiquitination-based cell cycle indicator (Fucci2) in HeLa cells allows for dual-color imaging and can be used to distinguish between live cells in the G1 and S/G2/M phases. Using this system for the in vivo analysis of the spatial and temporal patterns of cell cycle dynamics [32, 33], we demonstrated that Tax-expressing cells arrest in the G1 phase of the cell cycle and proceeded to apoptosis; and (iv) we found that Tax-induced changes in the expression of genes related to cell cycle regulation and apoptosis correlated well with the morphological changes observed in the cells. To examine whether Tax induces cell cycle arrest at the G1 phase and promotes apoptosis in HeLa cells, chimeric Tax carrying a Flag tag at the carboxyl terminus was transfected into HeLa cells. At 24 h post transfection, the expression of Tax protein was assessed by immunoblot analysis of cell extracts using the monoclonal antibody (MAb) M2, which recognizes the Flag tag (Figure 1A). A single band with an apparent molecular mass consistent with the predicted sequences was observed. As shown in Figure 1B, Tax was detected in both the nucleus and cytoplasm of transfected HeLa cells. This result correlates well with previous studies indicating that Tax is able to shuttle between the nucleus and the cytoplasm but predominantly localizes in the nucleus . As shown in Figure 1C, Tax showed considerable transactivation activity toward the HTLV-1 enhancer, indicating that chimeric Tax with a C-terminal Flag tag was fully functional. Tax induces G 1 cell cycle arrest and apoptosis. HeLa cells were transiently transfected with a pCAGGS-Tax Flag-tagged vector or the control pCAGGS vector (A, B and E) together with either the reporter plasmid pGV-HL21 (HTLV-1 enhancer) and the reference plasmid pRL-SV40 (C), or the GFP expression vector pEGFP-NI (D and G) or the pSV-β-galactosidase vector (F). (A) At 24 h post-transfection, cells were lysed and subjected to immunoblot analysis with an anti-Flag MAb and an anti-actin MAb (as a control). (B) At 24 h post-transfection, cells were fixed, permeabilized, and immunostained with an anti-Flag MAb followed by an Alexa 488-conjugated anti-mouse IgG antibody. Cells were analyzed by confocal laser scanning microscopy (Olympus FV1000). (C) At 48 h after transfection, cells were recovered and the activities of firefly and Renilla luciferases were measured in lysates. For each sample, the firefly luciferase activity (pGV-HL21) was normalized by reference to Renilla luciferase activity (pRL-SV40). (D) At 48 h post-transfection, cells were fixed and stained with propidium iodide for the analysis of DNA content. GFP-positive cells were analyzed by flow cytometry using Cell Quest for acquisition and ModFit LT. The peaks of the cells at G1 and G2/M phase are indicated. (E) At 48 h post-transfection, cells were collected, lysed, and analyzed for phosphorylation of Rb by immunoblotting with an anti-Rb MAb using an anti-actin MAb as a control. ppRb, hyperphosphorylated forms of Rb; pRb, hypo- and unphosphorylated forms of Rb. (F) At 48 h post-transfection, cells were collected, lysed, β-galactosidase activity was measured. Caspase-3 activity was measured in the cell lysates with an equal amount of β-galactosidase activity. Each of the columns and its associated error bar represent the mean ± standard deviation (SD) of results from four different experiments. The asterisk (*) represents a p-value of < 0.01. (G) At 48 h post-transfection, cells were stained with PE-Annexin V and 7-AAD to identify apoptotic cells. GFP was used as a reporter to discriminate between transfected and untransfected cells. The percentage of Annexin V-positive and 7-AAD-negative cells relative to GFP-positive cells indicates the level of apoptosis. Next, the cell cycle distribution of Tax-expressing HeLa cells was analyzed. Cells were stained with propidium iodide (PI) and analyzed by flow cytometry 48 h after co-transfection with the Tax expression vector or the control vector and a green fluorescence protein (GFP) expression vector, pEGFP-N1, which served as a marker plasmid. The histograms show representative data from one of three independent experiments. As shown in Figure 1D, flow cytometry analysis revealed that there was a marked increase in the percentage of cells in the G1 phase in cells transfected with Tax (approximately 92% ± 4.5%) compared with cells transfected with the control vector (approximately 58% ± 4.3%), strongly indicating that G1 cell cycle arrest was induced in Tax-expressing cells (p < 0.001). To confirm this result, total cell extracts were collected 48 h post-transfection and the phosphorylation status of Rb was determined by immunoblotting with an anti-Rb MAb, which detects all forms of Rb. The phosphorylation status of Rb serves as a marker of cells in the G0/G1 phase of the cell cycle, since Rb is progressively phosphorylated throughout the G1 phase and is hyperphosphorylated upon transition into the S phase . As shown in Figure 1E, hyperphosphorylated form (ppRb) migrated more slowly than the hypo- and unphosphorylated forms (pRb). The majority of Rb was hyperphosphorylated (upper major band) in cells transfected with the control vector; however, a decrease in the level of hyperphosphorylated form (ppRb) and an increase in the levels of hypo- and/or unphosphorylated form (pRb) were observed in extracts prepared from Tax-expressing cells. 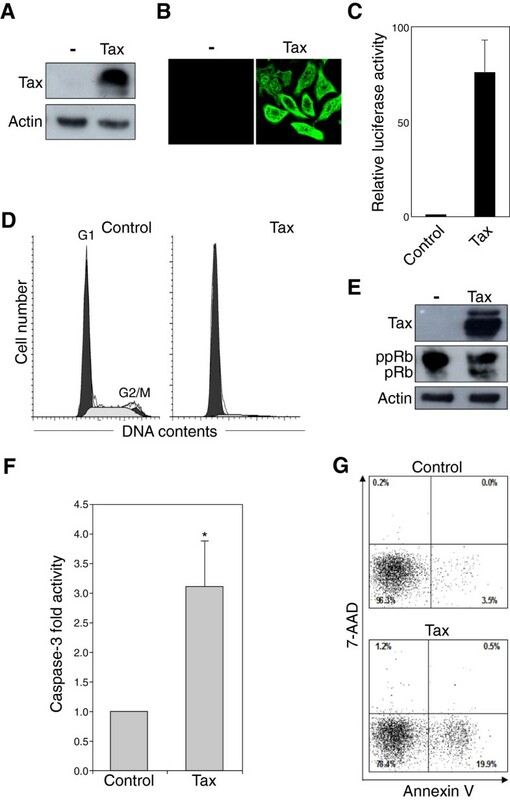 These results confirmed that Tax prevents hyperphosphorylation of Rb and blocks cell cycle progression at the G1 phase. To analyze whether Tax induced apoptosis, HeLa cells were transfected with a Tax expression vector or a control vector, and the activity of caspase-3, which plays an essential role in apoptosis, was measured. Caspase-3 activity was significantly higher in Tax-expressing cells than in control cells (Figure 1F; p < 0.01). Next, the apoptotic activity of Tax was further quantified using flow cytometry by co-staining transfected cells with phycoerythrin (PE)-Annexin V and 7-amino-actinomycin D (7-AAD) (Figure 1G). A prominent event in early apoptosis is the exposure of phosphatidylserine (PS) on the outer leaflet of the cell membrane. Cell surface-exposed PS is specifically detected by PE-Annexin V, and during the late stages of apoptosis or necrosis, cell membrane integrity is lost, allowing entry of the DNA-binding dye 7-AAD. The population of Annexin V-positive and 7-AAD-negative apoptotic cells was much higher in Tax-expressing cells (19.9%) than in cells transfected with the control vector (3.5%). Because the same trends were observed for caspase-3 activity (Figure 1F) and apoptotic activity (Figure 1G), it was concluded that Tax induces apoptosis in HeLa cells. To analyze the mechanism(s) underlying the regulation of cell cycle progression and apoptosis by Tax, total RNA was isolated from HeLa cells transfected with Tax or a control vector, and each RNA sample was subjected to microarray analysis (GEO accession number GSE34750). Data sets were analyzed using GeneSpring GX 11.0 software for gene expression, clustering, gene ontology, and significant signaling pathways. Using microarrays containing approximately 18,400 mRNA transcripts, 342 genes were identified (269 upregulated and 73 downregulated) that showed statistically significant levels of differential regulation by Tax (p < 0.05) (Tables 1 and 2). The upregulated genes (2-fold or greater) were clustered within functional groups involved in transcription/translation/RNA processing, signal transduction, the immune response, apoptosis, cell cycle regulation, and cell growth/proliferation (Table 1). In addition, a number of molecules involved in the immune response were significantly downregulated by Tax (Table 2). It was hypothesized that changes in gene expression may provide valuable information about the dysregulation of cell cycle progression induced by Tax and about how Tax might affect the genes relevant to this process. As shown in Figure 2A, of 17 genes related to cell cycle progression that were regulated by Tax, five were downregulated and 12 were upregulated (fold change > 2.0; p < 0.05). Genes associated with mitosis (CENPF, SEP11, and NF2), including the mitotic cell cycle checkpoint (MAD2L1) and mitotic centrosome separation (KIF11), were repressed by Tax. By contrast, genes upregulated by Tax were functionally classified as genes related to the cell cycle (GADD45A, RGS2, MAP3K8, SESN1, CDKN1A, CYLD, PLK2, SMAD3, JUN, GADD45B, DUSP1 and IL8). Many of these genes are also involved in other processes, such as the response to stress (GADD45B), the response to DNA damage (GADD45A, SESN1, CDKN1A), MAP kinase activity (GADD45B, MAP3K8, DUSP1), cell proliferation (JUN and IL8), and negative regulation of the cell cycle (CYLD, PLK2 and SMAD3). Genes such as SMAD3, GADD45B, and DUSP1 were also identified as having a role in apoptosis, and IL8 is additionally involved in inflammation and the immune response. The microarray results for genes related to cell cycle progression were validated by performing real-time quantitative reverse transcription polymerase chain reaction (qRT-PCR) on five upregulated genes (Figure 2B). The results of the qRT-PCR agreed with those obtained by microarray analysis. Next, Tax-regulated genes related to apoptosis were identified (Figure 2C). The microarray results revealed that 21 pro- or anti-apoptotic genes were regulated by Tax (fold change > 2.0; p < 0.05). Two genes associated with the induction of apoptosis, CARD10 and BCLAF1, were downregulated by Tax. The majority of the genes upregulated by Tax were involved in apoptosis. Furthermore, several of these genes also function in the immune response (ADORA2A, CD70, FAS, BCL6, TNFRSF1B and IL6). Interestingly, several highly upregulated genes, such as IER3, TNFAIP3, BIRC3 and IL6, have both pro- and anti-apoptotic functions. In contrast, the highly upregulated gene, TNFRSF9, is pro-apoptotic only. TNF and TNF receptor family genes were also found to be upregulated by Tax in this study. To confirm and extend the results of the microarray experiments, expression of the pro-apoptotic and anti-apoptotic genes regulated by Tax was measured by qRT-PCR using specific primers. Genes upregulated in the microarray were also upregulated in qRT-PCR (Figure 2D), although there were small differences in the levels measured by the two methods. For example, the expression levels of BIRC3 and IL6 measured by qRT-PCR were almost twice that measured by microarray analysis, and the expression level of the apoptosis inductor TNFRSF9 was more than three times higher by qRT-PCR than by microarray. Despite these minor differences, overall gene expression levels measured by qRT-PCR were similar to those measured by microarray analysis. To clarify whether Tax causes apoptosis independently of its ability to induce G1 arrest, the spatiotemporal patterns of cell cycle regulation in response to Tax expression were monitored in HeLa/Fucci2 cells . This system was chosen because it allows dual-color imaging, in which G1-phase nuclei are labeled orange and S/G2/M-phase nuclei are labeled green. A fluorescent Tax vector was constructed that allows the identification of Tax-expressing HeLa/Fucci2 cells. This vector contained Tax, an internal ribosomal entry site (IRES), cyan fluorescent protein (CFP), and a Flag sequence at the 3’ end of tax. The vector was expressed in HeLa cells, and Tax-expressing cells were stained with an anti-Flag MAb followed by an Alexa Fluor 594 secondary antibody (red). As shown in Figure 3A, all Tax-expressing cells were CFP-positive (blue). HeLa/Fucci2 cells were plated on a glass coverslip, transiently transfected with Tax-IRES-CFP or the CFP control vector, and then incubated for 24 h. Next, fields containing orange, green, and blue fluorescence were selected and images were acquired using an Olympus LCV110 Imaging System (Figure 3B and 3C). The proliferation of control HeLa/Fucci2 cells was evidenced by the fraction of cells at G1 phase with orange nuclei, the fraction of cells at S/G2/M phase with green nuclei, and the subsequent change in the fluorescence of these cells (Figure 3B upper panel and 3D), which indicated that the cells progressed normally through the cell cycle. At 24 h post-transfection, all HeLa/Fucci2 cells expressing Tax-IRES-CFP, which resulted in blue fluorescence, also had orange nuclei, indicating that they were in G1 phase (Figure 3B, lower panel). During the culture period, HeLa/Fucci2 cells expressing Tax-IRES-CFP did not progress to S/G2/M phase, as evidenced by the presence of orange nuclei and the absence of green nuclei in Tax-expressing cells (Figure 3B). Additionally, a marked decrease was observed in the proportion of Tax-IRES-CFP-expressing cells in S/G2/M phase compared with control cells expressing CFP alone (Figure 3D), indicating that Tax arrests cells at the G1 phase of the cell cycle. Interestingly, overexpression of Tax appeared to reduce the number of HeLa/Fucci2 cells in culture (Figure 3E). Moreover, apoptosis was assessed by the appearance of rounded cells after an increase in the number of Tax-expressing cells at G1 phase, starting at 36 h post-transfection (Figure 3B and 3C). At 72 h post transfection, there was a notable reduction in the overall number of cells, as well as in the percentage of Tax-expressing cells (Figure 3C and 3E). To analyze the correlation between the expression of genes related to cell cycle regulation (IL8, SMAD3, CDKN1A, GADD45A and GADD45B) and apoptosis (IL6) (that are altered following the induction of Tax) with the dynamics of cell cycle and apoptosis (shown in Figure 3), total RNA was prepared at 12, 24, 36 and 48 h after transfection of HeLa cells with Tax or a control vector. Each RNA sample was then subjected to qRT-PCR. 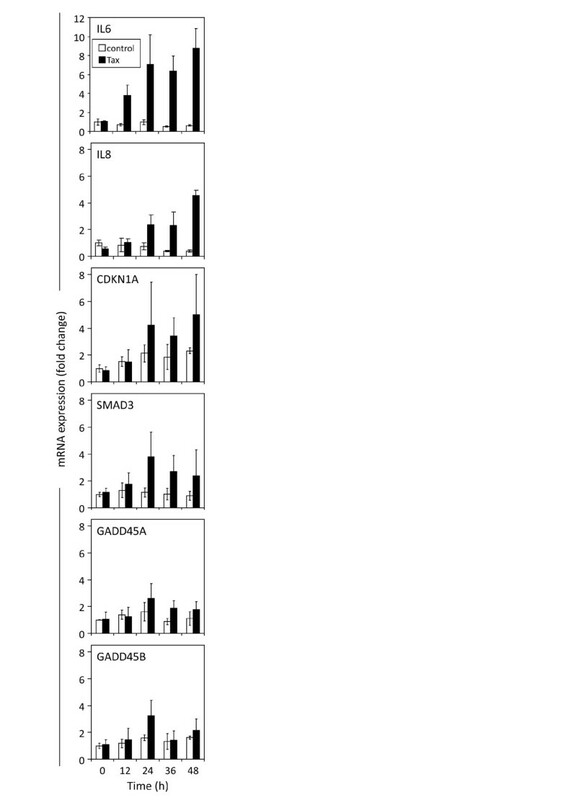 As indicated in Figure 4, the expression levels of SMAD3, GADD45A and GADD45B in Tax-transfected cells began to increase from 6 h post-transfection and reached a peak at 24 h, decreasing again by 36 h. In the case of IL8, CDKN1A and IL6 in Tax-expressing cells, the expression levels reached a peak at 24 h, decreased at 36 h, and then increased again at 48 h.
The kinetics and results from time-lapse imaging indicate that marked upregulation of IL8, SMAD3, CDKN1A, GADD45A, GADD45B and IL6 at 24 h post-transfection was well correlated with a notable reduction in the number of Tax-expressing cells and an increase of Tax-expressing cells in the G1 phase. This study used large-scale host cell gene profiling with human cDNA microarrays and time-lapse imaging of HeLa/Fucci2 cells to monitor the dynamics of Tax-induced cell death. Three major conclusions can be drawn from the data: (i) Tax induces cell cycle arrest at the G1 phase in HeLa cells as assessed by flow cytometry. This result was confirmed by the accumulation of hypo- and/or unphosphorylated form of Rb in Tax-expressing cells. Moreover, analysis of Annexin V-stained cells and caspase-3 activity clearly demonstrated that Tax promotes apoptosis. Thus, a high level of transiently-expressed Tax can arrest the cell cycle at the G1 phase and induce apoptosis in HeLa cells. (ii) The most interesting aspect of this study was visualizing the morphological dynamics of Tax-induced cell death after cell cycle arrest at the G1 phase. Time-lapse imaging of HeLa/Fucci2 cells showed that Tax-induced apoptosis was dependent on the ability of Tax to induce G1 arrest. (iii) Microarray data revealed that Tax induced gene expression changes in HeLa cells; 17 Tax-dependent genes were found to be related to cell cycle regulation and 23 to apoptosis (> 2.0-fold up- or downregulation). (iv) The kinetics of gene expression identified that Tax-induced changes in the expression of IL8, SMAD3, CDKN1A, GADD45A, GADD45B and IL6 closely correlated with the morphological changes of the cell cycle and apoptosis observed by time-lapse imaging. Since these genes are related not only to cell cycle regulation and apoptosis induction, but also to stress kinase pathways, the present study suggests that Tax may induce apoptosis and cell cycle arrest by activating genes related to stress-response signaling pathways. Many studies show that the Tax oncoprotein accelerates G1 progression [3, 4, 7–12] and is capable of stimulating anti-apoptotic signaling pathways [29, 30, 36, 37]. In contrast, the present study showed that Tax arrests cells at G1, thereby inducing apoptosis. Our results consist with previous results obtained using HeLa cells and SupT1 cells [20, 38]. There may be possible explanations for how Tax induces cell cycle arrest and apoptosis. One interesting finding from our microarray analysis was the marked activation of stress kinase pathways induced by Tax. In mammalian cells, two families of stress-responsive MAPKs, c-Jun N-terminal kinase (JNK) and p38, are activated by stimuli such as UV radiation, oxidative stress and translation inhibitors, as well as by inflammatory cytokines, tumor necrosis factor α (TNFα), and transforming growth factor β (TGFβ). These signaling pathways promote apoptosis, cell survival, cell cycle arrest, inflammation and differentiation [39, 40]. Interestingly, microarray analysis revealed that genes such as SMAD3 and SMAD4, which are the principal intracellular effectors of the TGFβ family [41, 42]; GADD45A and GADD45B, which are implicated as stress sensors and activated by TGFβ in a SMAD-dependent manner [43–45]; DUSP1, DUSP5, DUSP6 and DUSP13, which are stress-inducible MAP kinase phosphatases ; MAP kinase kinase kinase 8 (MAP3K8) ; JUN , which is the effector transcription factor of the JNK pathway; and IL6, IL8 and FAS, which are inflammatory cytokines, were all upregulated by Tax. These genes, expressed in response to Tax, are mediators of JNK and p38 activity. In addition, we found that the kinetics of altered expression of several genes related to pathways involving stress-responsive MAPKs were closely correlated with the kinetics of the spatial and temporal patterns of cell cycle dynamics analyzed in time-lapse imaging. At 24 h post-transfection with Tax expression vectors, the genes for IL8, SMAD3, CDKN1A, GADD45A, GADD45B and IL6 were significantly upregulated (Figure 4) and the number of Tax-IRES-CFP-expressing cells were in G1 phase and underwent apoptosis started to increase at same timing (Figure 3). Thus, the present results suggest that Tax may induce apoptosis and cell cycle arrest by activating several genes related to stress-response signaling pathways. This is supported by a recent publication showing that Tax, along with the activation of a stress kinase, can induce cell death . Furthermore, the present findings consist with those observed by previous microarray analysis studies of HTLV-1-infected T cells, which demonstrated that HTLV-1 infection upregulated JNK activation kinase 1, GADD45 and the inflammatory cytokine, IL1β, which are involved in MAPK stress-response pathways . Recently, HTLV-1 Tax appeared indirectly to connect to cell cycle proteins such as SMAD3, SMAD4, GADD45A and GADD45B . Our microarray analysis results identified one of the genes upregulated by Tax as CDKN1A, which codes p21CIP1/WAF1, known as Cdk inhibitor 1. Again, this is in agreement with results from other microarray analyses showing that HTLV-1 infection and Tax expression upregulated p21CIP1/WAF1 in HTLV-1-infected T cells  and the human Jurkat T-cell line JPX-9, which express Tax under the control of an inducible promoter . Likewise, Tax has previously been shown to dramatically upregulate p21CIP1/WAF1 mRNA transcription and stabilization of p21CIP1/WAF1 in HeLa cells [20, 21]. Interestingly, only minimal p21/WAF1 promoter activity appears to be induced by Tax . It is also known that basal levels of p21CIP1/WAF1 are required to promote TGFβ-mediated cell cycle arrest, whereas a lack of p21CIP1/WAF1 allows the induction of cell proliferation in response to TGFβ . Indeed, the loss of p21CIP1/WAF1 and p27KIP1 from HOS cells apparently allows HTLV-1-and Tax-induced G1 arrest to be bypassed . Therefore, Tax may induce cell cycle arrest and apoptosis in HeLa cells by up-regulating GADD45B, SMAD3 and SMAD4 (which act downstream of TGFβ) in the presence of p21CIP1/WAF1 (which is activated by Tax). In HTLV-1 infected T cell lines, upregulated p21CIP1/WAF1 may potentially function as an assembly factor for the cyclin D2/cdk4 complex, and the p21/cyclin D2/cdk4 complex may not act as an inhibitory complex but instead may allow the increased phosphorylation of Rb and accelerated progression into S phase . In the present study, Tax-mediated G1 arrest occurred in human papilloma virus type 18 (HPV-18)-transformed HeLa cells, in which the Rb pathway was activated by repression of HPV-18 E7 . Indeed, in cells transfected with the control vector, the majority of Rb was in the hyperphosphorylated form ppRb (Figure 1E). By contrast, an accumulation of hypo- and/or unphosphorylated form pRb was observed in Tax-expressing HeLa cells, which is in contrast to the results of study showing that Tax increased the phosphorylation of Rb family members . Therefore, there is a strong possibility that Tax-activated p21CIP1/WAF1 may function to inhibit the cyclin D2/cdk4 complex, thereby inducing cell cycle arrest. Our microarray result also shows that Tax upregulated the expression of BCL6 gene encodes a sequences-specific transcriptional repressor by 2.7 fold. This supported by the findings in previous study , which described that an interaction of Tax with the POZ domain of BCL6 enhances the repressive activity of BCL6 and increased the levels of apoptosis induced by BCL6 in osteosarcoma cells. The BCL6 POZ domain mediates transcriptional repression by interacting with several corepressors including silencing mediator for retinoid and thyroid receptor and nuclear hormone receptor corepressor, BCL6 corepressor together with many histone deacetylases. BCL6 colocalizes with these corepressors in punctate nuclear structures that have been identified as sites of ongoing DNA replication. Interestingly, BCL6 appeared to recruite Tax into punctate nuclear structures and significantly downregulate both basal and Tax-induced NF-kB and long terminal repeat activation . Thus, the high expression of BCL6 in HTLV infected cells may contribute to the silencing of viral gene expression and to the long clinical latency associated with HTLV infection. This study allows greater understanding of the biological events affected by HTLV-1 Tax, particularly the regulation of cellular proliferation and apoptosis. Since we found evidence of several similarities, as well as differences, between Tax-expressing HeLa cells and HTLV infection in T cell lines, we believe that the overexpression of Tax will be useful for preliminary studies on the effects of HTLV infection in T cell lines. However, since Zane et al. recently demonstrated that infected CD4+ T cells in vivo are positively selected for cell cycling but not cell death , our experimental approaches in HeLa cells may not be reflective of normal physiology of Tax or HTLV-1 in vivo infected cells. 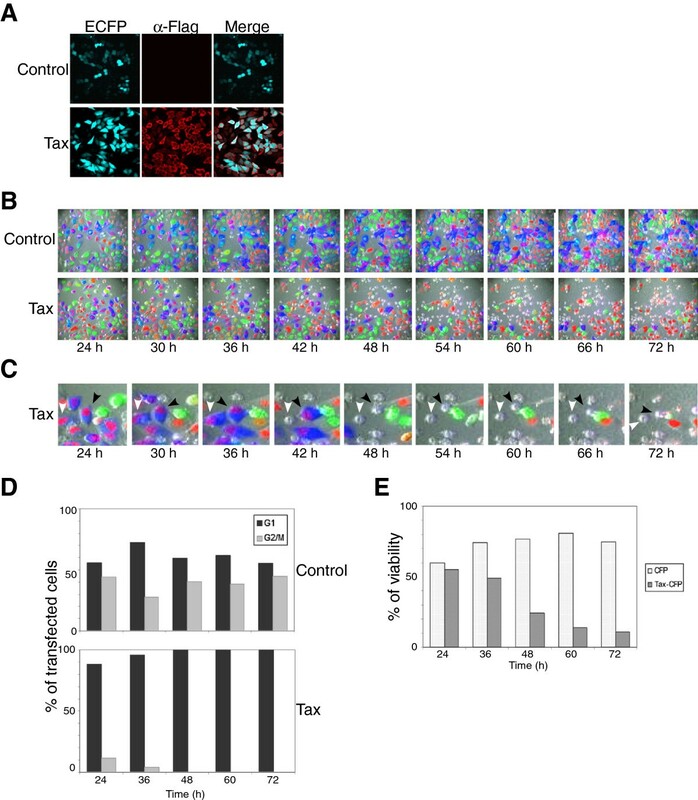 Therefore, further detailed studies are required to define the direct and indirect effects of Tax-mediated cellular processes to gain a better understanding of the contribution of Tax to HTLV-1 pathogenesis in vivo. The present study showed that Tax arrested cells at the G1 phase of the cell cycle, thereby inducing apoptosis. Taken together, the results demonstrate that Tax exerts a significant impact on cellular factors that regulate the cell cycle and the induction of apoptosis. Importantly, to the best of our knowledge, this is the first study to highlight the morphological dynamics of Tax-induced cell death after cell cycle arrest at the G1 phase. This overview can be extended to Tax-mediated signaling, and further study of the interactions between Tax and cellular factors will provide insights into the mechanisms by which Tax regulates host cell behavior, as well as the mechanisms underlying lymphoma induction and progression induced by HTLV-1. Human cervical HeLa cells and Fucci2-expressing HeLa cells (HeLa/Fucci2)  were maintained in Dulbecco’s modified Eagle’s medium (DMEM) (Invitrogen) supplemented with 10% heat-inactivated fetal bovine serum (FBS) and 100 units/ml penicillin/streptomycin (Sigma). Cells were transiently transfected with a Tax expression vector, or a control vector, using Fugene HD (Roche) according to the manufacturer’s instructions. The HTLV-1 tax gene was amplified from the HTLV-1 infectious molecular clone, K30 , using the primers HTax-F (5’-3’, AACTCGAG GCCACCATGGCCCATTTCCCAGGGTTTGGAC) and HTax-R (5’-3’, AAGCGGCCGC TCACTTGTCGTCATCGTCTTTGTAGTCGACTTCTGTTTCTCGGAAATGTTTTTCACTGG). The underlined sequences correspond to restriction enzyme sites specific for Xho I and Not I, respectively. A Flag sequence was included at the 3’ end of the tax gene. Full-length tax was then cloned into the Xho I and Not I restriction sites in the pCAGGS mammalian expression vector . To generate the pCAGGS-Tax-IRES-CFP vector and the pCAGGS-IRES-CFP control vector, the IRES was amplified from the pRetroX-IRES-ZsGreen1 vector (Clontech) and CFP was amplified from the pCS2+ vector (Clontech). The IRES and CFP sequences were then inserted into the pCAGGS control vector or a pCAGGS vector containing Flag-tagged Tax. The vector pEGFP-N1 encodes a red-shifted variant of wild-type GFP that was modified for brighter fluorescence  and which was used as a reporter to identify transfected cells by flow cytometry. The pSV-β-galactosidase vector (Promega) encoding a bacterial β-galactosidase and pRL-SV40 (Promega) encoding Renilla luciferase were used to normalize the transfection efficiency. pGV-HL21 encodes five tandemly repeated 21 bp enhancers of HTLV-1, each of which contain a CRE motif and pGV(−) and have been previously decribed . HeLa cells were transiently transfected with Tax or the control vector and incubated for 30 h. RNA from total cell extracts was isolated using the RNeasy Mini Kit (Qiagen) according to the manufacturer's instructions. RNA was quantified using a spectrophotometer and stored at −80°C. For gene chip analysis, the quality of RNA was determined using the Agilent Bioanalyzer (Agilent Technologies). RNA samples were analyzed by microarray using the GeneChip Human Genome U133A 2.0 Array (Affymetrix). Microarray hybridization and fluorescence detection were performed as described in the Affymetrix Gene-Chip Expression Analysis Technical Manual. Microarray data were deposited in NCBI’s Gene Expression Omnibus and assigned GEO Series accession number GSE34750. GeneSpring GX 11.0 software (Agilent Technologies) was used to identify statistically significant differences in gene expression between samples. For multiple measurements to detect significantly upregulated and downregulated genes, the Bonferroni correction was performed by adjusting the significance level (p < 0.05). Fold changes in gene expression, hierarchical clustering, and gene ontology annotations were determined. Total RNA was prepared using the RNeasy Mini Kit (Qiagen) at 12, 24, 36 and 48 h after transfection with Tax or the control vector. RT-PCR was performed using specific primers and OneStep SYBR Green PCR mix (Takara) following the manufacturer’s instructions. The qRT-PCR was performed using a 7500 Fast Real-time PCR System (Applied Biosystems). All data were normalized to GAPDH mRNA. Transfected cells were lysed and proteins were separated on 6%, 10%, or 17% SDS-polyacrylamide gels and then transferred to a PVDF membrane (Immobilon-P, Millipore Corp.) using a Trans-blot SD semi-dry transfer cell (Bio-Rad). Following the transfer, the membranes were blocked in 5% non-fat dry milk in PBS containing 0.1% Tween-20 for 1 h and then incubated with a 1:1000 dilution of primary antibody against Flag (M2, Sigma), Rb (c-15, Santa Cruz Biotechnology), or actin (c-11, Santa Cruz Biotechnology) for 1 h. The membranes were then washed and incubated with anti-mouse, anti-rabbit, or anti-goat horseradish peroxidase-conjugated secondary antibodies (Jackson, ImmunoResearch) and developed using the SuperSignal West Pico Chemiluminescent substrate Kit (Pierce). Cells (1 x 105) were seeded onto 22 mm diameter coverslips in 24-well plates and incubated at 37°C for 24 h before transfection. Cells were transiently transfected with either a Tax expression vector or a control vector using the Fugene HD reagent (Roche). Twenty-four hours later, the cells were washed twice with PBS, fixed in 3.7% formaldehyde, permeabilized using 0.2% Triton X-100, and stained with an anti-Flag MAb (M2, Sigma) followed by an anti-mouse IgG1 antibody conjugated to Alexa Fluor 488 or 494 (Molecular Probes). Subcellular localization was analyzed by confocal laser scanning microscopy (FV1000, Olympus). HeLa cells (1 x 105) were transfected with 1 μg of the reporter plasmid, pGV-HL21 (HTLV-1 enhancer) or pGV(−), 0.3 μg of the reference plasmid, pRL-SV40, and 0.5 μg of the Tax expression vector. At 48 h after transfection, cells were recovered and the activity of firefly and Renilla luciferase was measured in the lysates as previously described . For each sample, firefly luciferase activity (pGV-HL21) was normalized by reference to Renilla luciferase activity (pRL-SV40). HeLa cells (4 x 105) were incubated in a 6-well plate at 37°C for 24 h followed by co-transfection for 48 h with 2 μg of the Tax expression vector or the control vector and 0.2 μg of the pEGFP-N1 vector. Cells were collected and washed with PBS without Ca2+ and Mg2+ and then fixed with 1% paraformaldehyde followed by 70% ethanol. After fixation, cells were washed twice with PBS, treated with 200 μg/ml of RNase for 1 h at 37°C, and stained with 50 μg/ml of PI. Fluorescence was analyzed using a FACSCalibur (Becton-Dickinson) flow cytometer and Cell Quest software (Becton-Dickinson). Samples were gated to eliminate cells in which GFP emitted strong fluorescence. The acquired FACS data were analyzed using ModFit LT software (Verity Software House). Flow cytometry was used to detect Annexin V-positive apoptotic cells. Transfected cells were incubated for 48 h and then the cell monolayers were detached with trypsin and ethylendiaminetetraacetic acid (EDTA), washed twice in PBS, and re-suspended in binding buffer (1 x 106 cells/ml). An aliquot of 1 x 105 cells was stained with 7-AAD and Annexin V-PE (BD Biosciences) for 15 min at room temperature according to the manufacturer's instructions and then analyzed on a FACSCalibur flow cytometer (BD Biosciences) with Cell Quest software (BD Biosciences). Cells were considered to be in the early stages of apoptosis if they showed staining for Annexin V-PE but not 7-AAD. The double-positive population was considered to be in the late stages of apoptosis, or already dead. Caspase-3 activity was measured using a caspase-3/CPP32 fluorometric assay kit, according to the manufacturer's instructions. Briefly, transfected HeLa cells were harvested, washed twice with PBS, and treated with lysis buffer. Cell lysates were centrifuged at 15000 × g for 10 min at 4°C, supernatants were collected, and protein concentrations were determined with the Pierce BCA protein assay kit (Thermo Scientific). For each experimental point, 50 μg of total protein extract was incubated with the substrate for 2 h at 37°C. Caspase activity was quantified spectrophotometrically at a wavelength of 405 nm using a multi-label counter (Model 1420, Wallac Arvo, Perkin Elmer Life Sciences). HeLa/Fucci2 cells were transiently transfected with Tax-IRES-CFP or the control vector and were subjected to long-term, time-lapse imaging using a computer-assisted fluorescence microscope (Olympus, LCV110) equipped with an objective lens (Olympus, UAPO 40×/340 N.A. = 0.90), a halogen lamp, a red LED (620 nm), a CCD camera (Olympus, DP30), differential interference contrast (DIC) optical components, and interference filters. For fluorescence imaging, the halogen lamp was used with three filter cubes for observing mCherry (orange), Venus (green), and CFP (blue) fluorescence. For DIC imaging, the red LED was used with a filter cube containing an analyzer. Image acquisition and analysis were performed using MetaMorph 7.7.4 software (Universal Imaging). The authors thank Dr. Eri Takeda for kind help and suggestions; Dr. Shin-nosuke Takeshima for submission of microarray data in the NCBI’s Gene Expression Omnibus and kind help of preparation of manuscript; Mr. Tomoyuki Murakami for help with drawing the figures of the manuscript; Drs. Guangai Xue and Muhammad Atif Zahoor for help with the microarray analysis; and other members of the Viral Infectious Diseases Unit, RIKEN, for their help with the experiments. The authors thank Dr. Atsushi Miyawaki for kindly providing the plasmids (pRSETB-CFP and pCS2+) and HeLa/Fucci2 cells, and Drs. Asako Sakaue-Sawano and Dr. Roger Y. Tsien for kindly providing the HeLa/Fucci2 cells. We would like to thank Mr. Keisuke Fukumoto for help with the microarray analysis; Mr. Tetsuya Tajima for excellent technical assistance with the Imaging; We are grateful to the Support Unit for Bio-material Analysis, RIKEN BSI Research Resources Center for help with sequence and microarray analyses; the RIKEN BSI-Olympus Collaboration Center for help with imaging; and the RIKEN BioResource Center Cell Bank for help with the distribution of HeLa/Fucci2. We thank the NIH AIDS Research and Reference Reagent Program for providing the HTLV-1 infectious molecular clone K-30. This work was supported by a Grant-in-Aid for Scientific Research (A and B) and by a grant from the Program for the Promotion of Basic and Applied Research for Innovations in Bio-oriented Industry. MA performed the experiments, analyzed the data, and wrote the manuscript. HM performed the qRT-PCR and analyzed the data. YA conceived the study, participated in the experimental design, analyzed and interpreted the results, coordinated experiments, and wrote the manuscript. All authors have read and approved the final manuscript.